Climb inside a new CASE compact track loader (CTL) and you’ll feel the difference. Engineered from the ground up, this new line-up of equipment delivers more power, comfort and control options. And that’s just the start. Our new CTLs delivers exceptional bucket breakout force and hinge pin height. All three models deliver superior horsepower, giving you the muscle to get the job done faster. You'll also get a larger, pressurized cab and several choices of controls to keep your operators productive. Then, check out the easy maintenance and serviceability that help you get more work done daily. 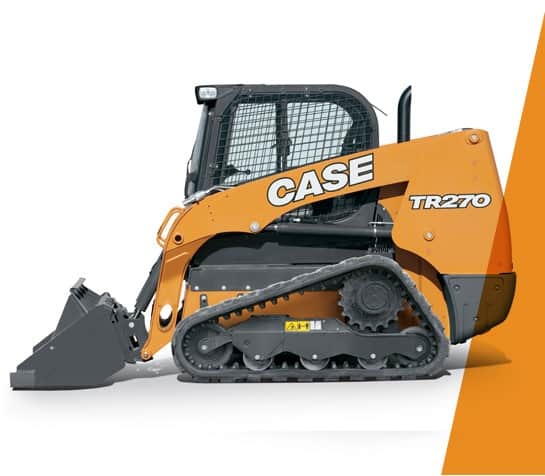 Climb inside a new CASE compact track loader (CTL) and you’ll feel the difference. Engineered from the ground up, this new line-up of equipment delivers more power. And that’s just the start. Our new CTLs delivers exceptional bucket breakout force (up to 38,7 kN) and hinge-pin height (up to 3.342 mm). All three models deliver superior horsepower, giving you the muscle to get the job done faster. Plus, they’ll run all day long, thanks to improved fuel effi ciency and new 76- to 96.5-lt fuel tanks. One demonstration will prove it’s time to trade up. CASE compact track loaders have the muscle to get the job done - with rated operating capacities up to 1.948 kg*. Our radial-lift TR270 and TR320 models are engineered for digging, prying and pushing, while the vertical-lift TV380 is for oad-and-carry jobs. Plus, we deliver superior hinge pin height - which positions the bucket higher to load trucks faster and easier. There’s no comparison. Our engineers designed a cab that delivers more room, visibility, comfort and control. Not only are they as much as 25 percent larger, but they also feature dozens of upgrades, such as optional heated air-suspension seats, air conditioning, a removable front door and side windows. Our revolutionary ultra-narrow wire side-screen design and larger glass windows give you more visibility. With the CASE-exclusive side lighting, you’ll get more done - day or night.